Cornerstone content pieces are those articles on your website you’re most proud of. They reflect your business, communicate your mission and are extremely well written. These are the articles you would like to rank high in the search engines. Cornerstone articles are usually explainers; these articles combine insights from different blog posts. Here, I’ll explain all about cornerstone content. I’ll tell you what cornerstone content is, why it’s important for SEO, how to write this type of content and how you should link from your posts to your cornerstone articles. Which articles are my cornerstones? Choose your cornerstones carefully. Think of four or five pages you would like someone to read if they first visit your website. These articles should be the cornerstones of your site. Which articles are most precious to you? Which articles are the most complete and authoritative? You should write cornerstone articles about the keywords you definitely want to rank for. 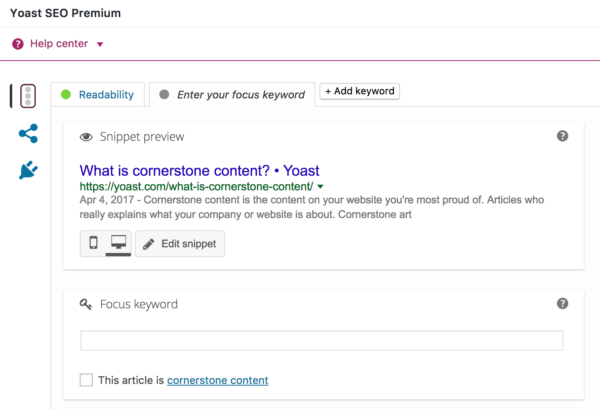 As of now, Yoast SEO will ask you to indicate whether or not an article is a cornerstone article. 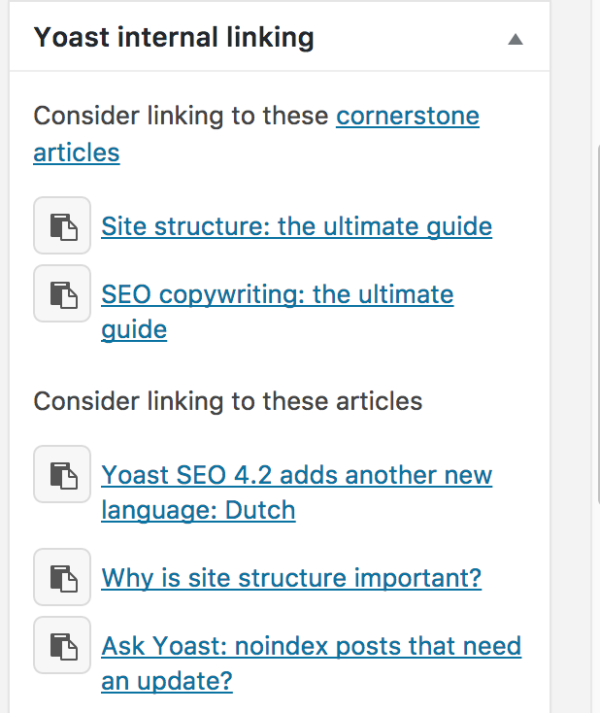 By marking articles as cornerstone, Yoast SEO can help you build a solid internal linking structure. Our link suggestion tool will give priority to the articles that you mark as cornerstone content. If your website is enormous, you’ll have more cornerstones than if your website is small. You’ll probably write about more than one topic, so make sure to choose a cornerstone article in each category. Why are cornerstone articles important for SEO? Cornerstone content plays a significant role in any SEO strategy. It can be rather hard to rank for search terms that are very popular. A cornerstone approach could help you tackle those competitive search terms. If you write a lot of articles about similar blog posts, you need to tell Google which one is the most important. Otherwise, you’ll be competing with your content for a place in the search results. If you provide the proper internal linking structure between your posts, you can show Google which article is the most important. Cornerstone articles should appear very high in your site’s pyramid. Ideally, one would be able to click from your homepage to your cornerstone articles instantly. You should link all your other posts about similar topics to that particular article. Subsequently, you will write tons of new blog posts focussing on new angles of the topic of your cornerstone article. From every single one of those blog posts, you’ll link to your original cornerstone article. Such an internal linking structure will increase the chance of your cornerstone content article ranking in Google. For instance, I write a lot of different posts about SEO copywriting. All these posts focus on a different aspect of SEO copywriting. One of my articles is my cornerstone article, in this case, the Ultimate Guide to SEO Copywriting. I will make sure to link from all of my posts about SEO copywriting to that one important cornerstone article. In Yoast SEO Premium, we offer internal linking functionality. 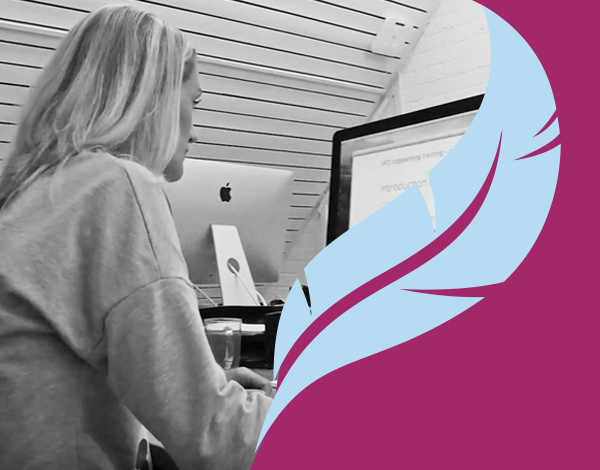 We analyze the text you are writing and use the prominent words in that text to determine which articles are of a similar topic. These are the articles you should be linking to. Cornerstone articles are treated differently in our calculation of internal linking suggestions. They are more important and will receive a higher value. To give these articles some visible weight as well, we place the cornerstone articles above the list of the internal linking suggestions. That’ll make it much easier for you to link to your critical articles. Cornerstone content should always be content pages. It could be a blog post, but you could also make a page out of it. The content should be updated very regularly. Cornerstone articles should be explainers, so these should definitely be informative articles. In your cornerstone article, you should aim to rank for the most competing keywords. Cornerstone articles are usually rather long. Everything that’s important about a certain topic should be covered in your cornerstone article. That’ll ask quite a bit of your writing skills. Lengthy articles are usually hard to read, especially from a screen. Make sure to use sufficient headings. An index at the beginning of a long cornerstone article is also a great idea. Ideally, you should do extensive keyword research. After that, you can produce really awesome, long, informative and beautifully written cornerstone articles. But what if you do not have that much time? And what if you’ve already written tons of articles? Follow these five steps to make killer cornerstone content. You have to determine the essential keywords you want to rank for. Your cornerstone articles should be optimized for the ‘head’ or most competitive keywords. Be sure to carry out keyword research. Go through the posts that are optimized for keywords surrounding the most important keywords. Which post do you think is the best? That’ll be your cornerstone from now on! Rewrite your cornerstone article. Make it awesome and SEO-friendly. Expand it and make sure it’s totally up to date. You should rewrite and expand that article regularly. The other blog posts about similar topics as your cornerstone article should be optimized on long tail variants of the ‘head’ keyword you’re attacking in your cornerstone article. You have to tell Google that your new cornerstone article is the most important one on your site. Don’t forget to link from all the long tail articles to your cornerstone article! Site structure is important for SEO. Having a solid site structure means both search engines and visitors can effortlessly navigate your site to find what they want. To help you with this, we are currently working on many more features in Yoast SEO that’ll improve the structure of your website.